In Parts 1 and 2 of this three-part blog series, we’ve already discussed the 3 steps to ensure excellence in remote & mobile notaries and the importance of notary quality assurance in the pre & post close reviews. For Part 3, we’ll review the most critical consideration when selecting a solution for e-closing – the borrower experience. NotaryWorks™ from Accurate Group delivers the right combination of technology and services to ensure a quality experience for your borrowers from beginning to end. Whether you leverage Remote Online Notary Solutions or Traditional Notary services, the same dedication to quality is our first priority. NotaryWorks is the most convenient e-closing technology platform on the market today. This web-based e-notary platform enables anytime, anywhere access, streamlining the loan closing process by electronically bringing borrowers and notaries together. When the remote notary option is selected, the notary meets with the borrower online – maximizing convenience for the consumer. 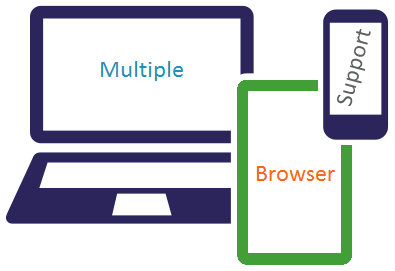 The NotaryWorks platform is compatible across multiple devices so the borrower can choose the most convenient option for e-signing. And for those borrowers who prefer the more traditional approach, a mobile notary can meet in the borrowers’ home, bank branch or public location. Electronic documents mean no lost documents due to courier services. NotaryWorks uses Knowledge Based Authentication (KBA) to confirm ID and correct answers grant access to the closing documents. Executed documents are saved, stored and sent electronically to all participants – efficient, safe and secure! Accurate Group received a request for Remote Video Notary services on a Thursday. The credit union stated the borrowers lived on an island off the mainland where they owned several businesses. Because the borrowers rarely had a need to leave the island and were very busy, they preferred the convenience of Remote Video Notary service. The twist in the deal was that the property was located in a county that does not e-record. Our experienced NotaryWorks team spoke with the Register of Deeds office, explaining the opportunity and in turn, they assured us they would accept the printed Deed of Trust without question. Our remote video notary met with the couple at the appointed time on the following Monday. KBA was used to confirm identification along with an on-camera review of each borrower’s photo ID. The closing took less than 30 minutes and docs were in hand Monday morning. By Thursday afternoon, our e-signed and e-notarized security instrument was made public record. The borrowers expressed to the credit union that they were very happy they were offered the option to sign online. The above example moved our lender client from theory to practice. The Remote Video Notary solution became a reality; a proven, quality product they could offer other clients going forward. As an added benefit, our lender clients have the option to lead the signing or just be on standby to assist if needed. Remote Video Notary workflows narrow the gap between closing and recording while providing tremendous convenience to borrowers and proves that it can also work in non-e-record counties as well. Accurate Group had an opportunity to perform a Remote Online Notary closing where the borrowers joined from two different locations – one local to the subject property and one in a foreign country. The local borrower underwent the normal KBA process and passed. The borrower abroad underwent a forensic review of their Visa and driver’s license and passed. During the closing, the borrower noticed a document error. The notary notified Accurate Group in real-time and the lender was able to send a corrected document within minutes. The new document was sent to the notary and executed by the borrowers, adding only 10 minutes to the total closing time. 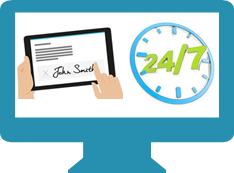 The signing and notarization concluded successfully without major delays, thanks to the ability to handle the exception in real time. NotaryWorks is a proven, flexible e-signing platform, continuously evolving to meet borrower and lender needs. In this situation, borrowers living or working in foreign countries would have to make arrangements with a U.S. Consulate to sign and notarize loan papers, often adding weeks to the process. As in the above case study, incorrect documents would have added even more time to the closing process, possibly delaying the closing for up to two months. Having the ability to replace erroneous documents in real time is a huge convenience to the borrower and lowers the risk to the lender of losing a deal or delaying revenue. In the competitive real estate lending environment, it is important to provide the best possible borrower experience. 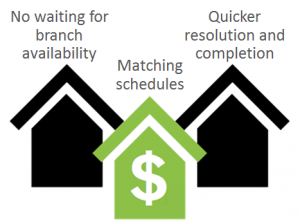 NotaryWorks is a user-friendly, transformative solution that addresses lender e-closing needs and goes above and beyond other solutions to ensure a high-quality, efficient closing that delights the borrower. Through the Knowledge Based Authentication (KBA) process, Accurate Group has incorporated interpreter services as well as foreign photo identification (passports and driver’s licenses) forensic analysis to ensure the authenticity of non-U.S. citizens when appearing before our e-notaries.